OK, I think we can all agree with this badge! I mean who doesn't love sweets, right. 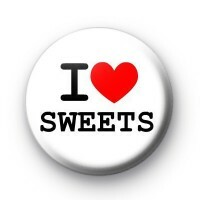 This 1-inch I Love (heart) Sweets badge is perfect for anyone with a sweet tooth. We have a huge selection of I love themed badges in the shop so make sure you take a look at them too.